We moved offices a few months ago. Our first office (if you could call it that), was a 100 sq ft basement room in Center615. To get an idea of how small 100 sq feet is – it is approximately the size of your home bathroom or a modest walk in closet. When Jennifer joined Wiley and Travis in October – the closet office suddenly became less “cozy” and more like a claustrophobic nightmare. We needed a new office. After some meh searching of Craigslist and the awful, ugly, un-usable commercial real-estate sites out there we found TenantBase. It was great. The people were great, the listings were great. The weird size/pricepoint we needed no longer seemed to be a problem. So after signing a terrifying 50-page lease (no hermit crabs, no using the office shower), we were in. Why thank you. I know. It’s great. We love the space. 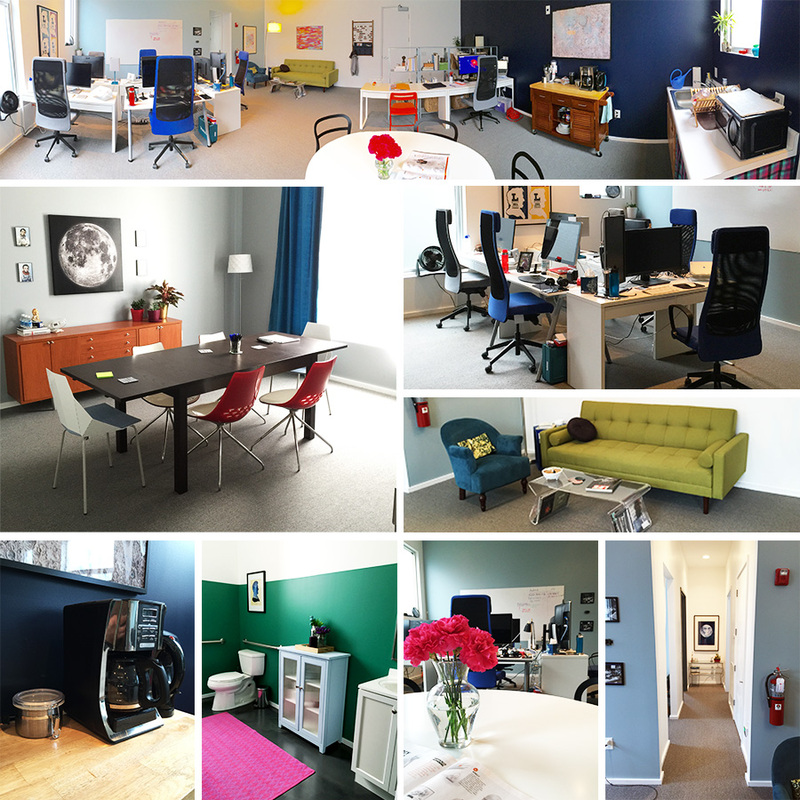 We love filling it with the very best developers and designers and being the preferred place for client meetings. Creating a comfortable work environment is important for quality work. We may not have all the fancy-fun trimmings of San Francisco startups, but we have what you need for a solid day of coding. A couch to chill on, a coffee pot for chemical energy, and a candy dish that mysteriously empties itself at least once a week. We also really enjoy being in Germantown. Despite rivaling the Gulch in ongoing construction, the ever changing view from the conference room window is pretty entertaining. Plus we have oh so excellent neighbors, including XOEye, Mountain, Onin Group, Tempured European Indulgence (yum chocolate), and the Skillery, just to name a few. Now all we need are a fewwww more lunch places to make the neighborhood perfect. (I can’t live on Cupcake Collection forever).